The bakery owners at the centre of the controversial ‘gay cake’ case have spoken of their delight as the highest court in the land cleared them of discrimination. After a protracted and costly legal action, the case brought by the Equality Commission for Northern Ireland (ECNI) has been comprehensively rejected. 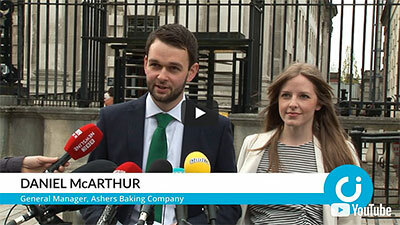 Ashers Baking Company went before the Supreme Court in May in a bid to overturn a 2015 judgement that it had broken political, religious and sexual orientation discrimination laws. Belfast County Court ruled against Ashers, run by Christian family the McArthurs, for declining an order to make a £36.50 cake with the campaign slogan ‘Support Gay Marriage’ for a gay rights event because they felt it conflicted with their deeply-held religious beliefs. Pursued since 2014 by the taxpayer-funded Equality Commission, Ashers mounted a vigorous defence, supported by The Christian Institute. “I want to start by thanking God. He has been with us during the challenges of the last four years. Through the Bible and the support of Christians, He has comforted us and sustained us. He is our rock and all His ways are just. “The judges have given a clear signal today. In fact it couldn’t be any clearer. Family businesses like ours are free to focus on giving all their customers the best service they can – without being forced to promote other people’s campaigns. “On behalf of my family can I say thank you to everyone who has supported us or prayed for us through all this. I do want to take this opportunity to thank our whole legal team for working so hard for us over the last four years. And also to thank the entire Christian Institute staff for their help and support from the very beginning. Peter Lynas, director of Evangelical Alliance Northern Ireland, commented: “This is a win for everyone – no-one should be forced to say something that they disagree with.